Painting vehicles is, I find, a challenging task; getting a consistent finish over large textured surfaces and (since most vehicles benefit from being constructed and painted in sections) ensuring the colours look the same for each part (especially when blending or mixing comes into play) is difficult. As a result, when I end up buying vehicles I try to get them painted in as few sessions as possible. 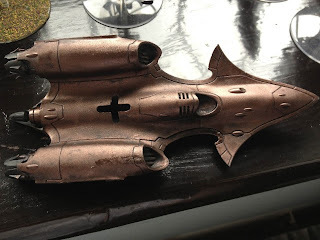 I originally intended to make my converted Autarch (now christened Cuchlann, Master of Ruses and Lord of Rhymes) my next update; the conversion process was a fun one but involved some parts I couldn't remember the provenance of. The gun on the jetbike is one of the antennae off the Fire Prism kit (the knobbly fin-like one), the cane is the banner pole off a jetbike kit and the hand holding it is the handlebar-holding arm from the bike's rider (with the elbow repositioned). The legs, in order to get the surfing stance, were an outrider off a Dark Eldar Venom, while the torso was a jetbike rider. I added a simple scarf made of green-stuff, and the book and head were from various High Elf kits (although I can't remember which). The arm holding the book used to have a massive wizard-robe sleeve on it so that needed cutting off and the smooth surface green-stuffed to match the shape of the arm. 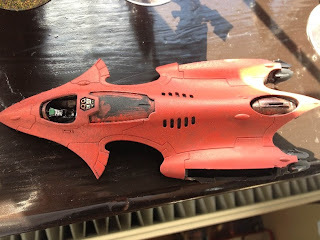 Since that photo was taken I painted a blue triangle on the prow of the bike using a tip someone at my club recommended - cigarette-papers adhere to painted models and work as stencils but are less likely to pull the paint off when removed. 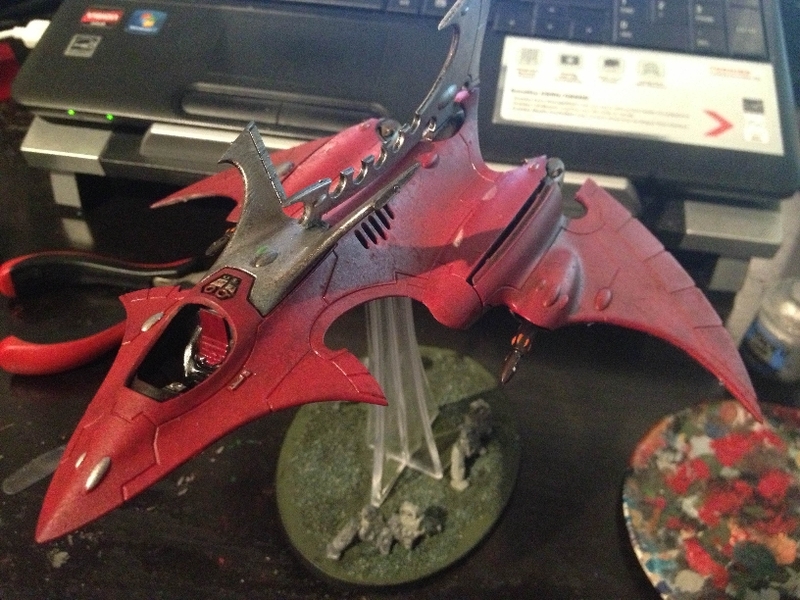 The Crimson Hunter, which has become the next main Tale of Painters piece for me, was the second vehicle I added to my Eldar army; the first, a Fire Prism, I painted in a kind of patchwork of all the principal colours of my army's scheme. 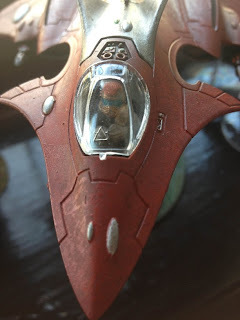 After having attempted stippling on my second unit of jetbikes, I wanted to apply it to a much larger surface and so set off on a flyer with large flat panels to paint. The first step after building the central fuselage and priming it was painting the cockpit while it was still easy to reach. Since it is not exactly visible most of the time, I went for a simple scheme - the control panel Warplock Bronze with a Goblin Green monitor, and the seat upholstery Mephiston Red and heavily coated with Ardcoat to look like fake leather. I can imagine Eldar having really naff upholstery in their vehicles. 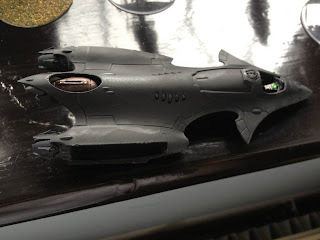 At this point I also painted the connecting-point for the tailplane to the engine nacelle with Warplock Bronze. Before getting stuck into the red, I painted the underside of the aircraft. 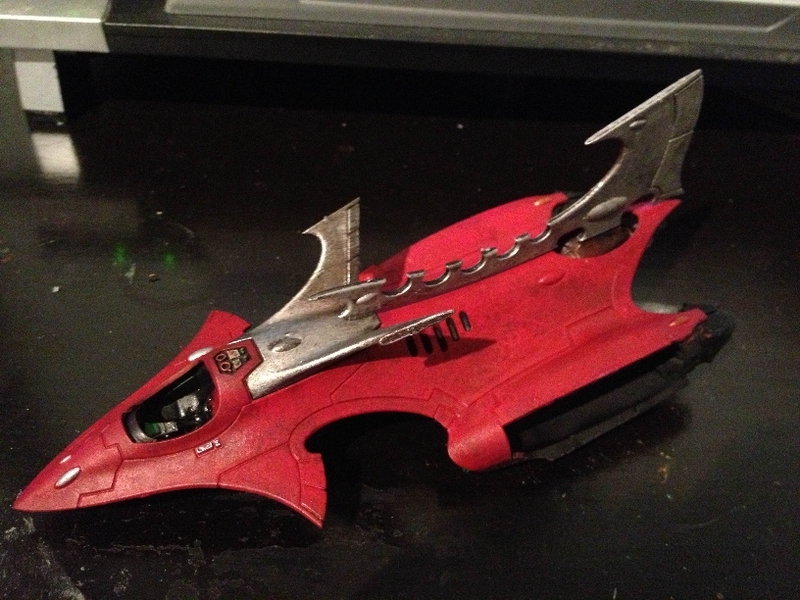 I painted it with Warplock Bronze and followed that with a layer of Ironbreaker, in line with my Fire Prism and all my jetbikes' metallic sections. To get a more mottled effect and bring out the panel lines I then applied a heavy wash of Nuln Oil. The next step was the moment of truth - testing the stippling effect. After painting the control panel/access hatch on the roof of the cockpit, I set to work painting the bodywork Khorne Red. It took two to three quite thinned coats to get a good coverage without visible brush-marks. 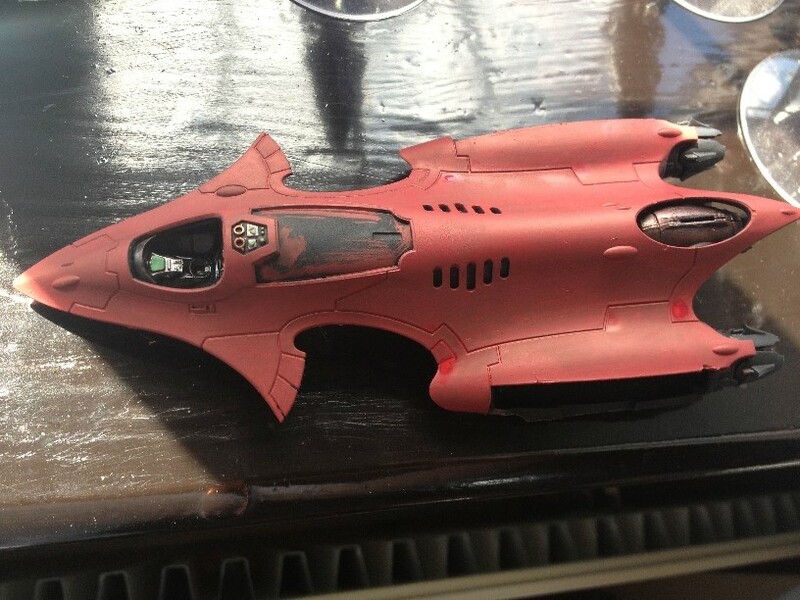 Once that had dried I took a Large Drybrush and set about stippling Mephiston Red over the red basecoat. This involves getting a small amount of paint on the brush (as if drybrushing) and dabbing vertically at the model. The results came out well and all that remained was to seal it with Bloodletter red glaze. 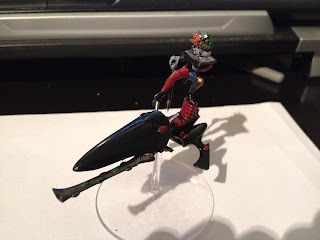 As I can never field a model unconverted, I set about modifying the Crimson Hunter slightly. I used the dorsal spikes from the Hemlock (included in the kit) as well as the forward wings of the Crimson Hunter itself. 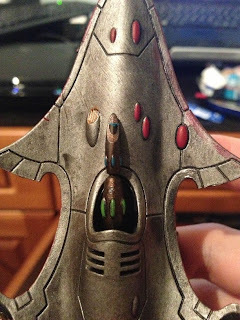 After that, all that remained was to add the guns and paint all the gems and vents dotted around the craft. 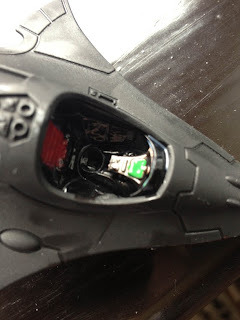 The wings were painted separately in exactly the same method as the fuselage and glued onto the body (leaving paint off the contact points) and the pilot was also painted outside the cockpit. 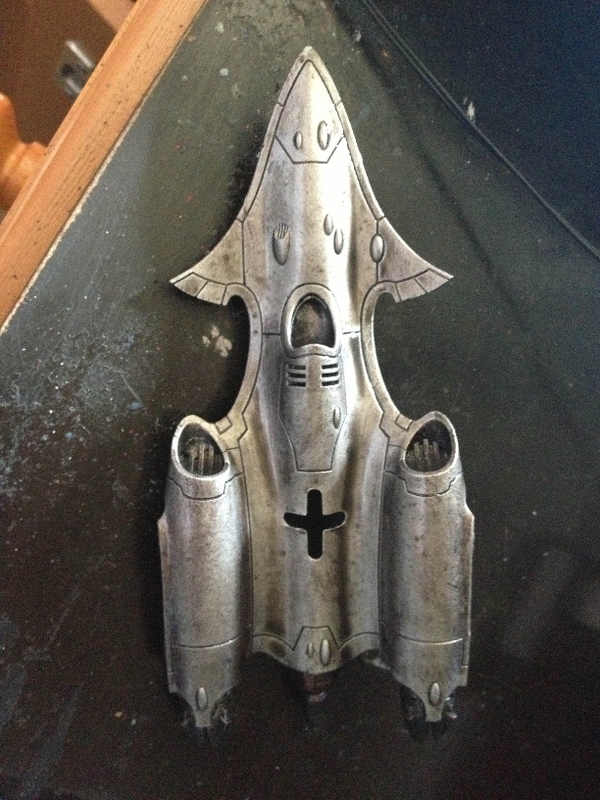 For my next progress report, I will be working on a unit of Wraithguard - and possibly some Apocalypse scenery as well.